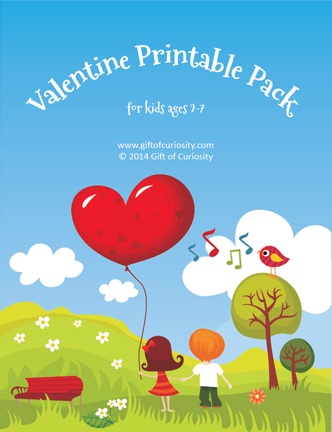 If you’re on the hunt for Valentine’s activities, make sure you don’t miss this Valentine Printable Pack. Gift of Curiosity is offering this free packet to email subscribers. This set is geared toward kids ages 2-7. It contains 77 activities focused on skills such as shapes and colors, same vs. different, sorting / sequencing / categorizing, puzzles, mazes, fine motor, math, and literacy. Many of the activities have multiple versions so you can easily tailor the difficulty of the activity to your child’s skill level. Thank you for sharing my Valentine Printable Pack with your readers!